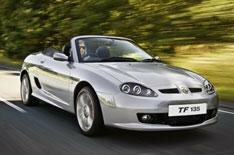 MG launches new TF models | What Car? MG has announced two new TF models and confirmed that it will take part in the Government's scrappage scheme, which starts next week. The new entry-level TF 135 will cost 13,511 making it nearly 2500 cheaper than the TF LE500's price of 16,055. Significantly, it will also undercut the most basic MX-5 rival by nearly 5000. MG hasn't confirmed standard equipment yet, but the new model will be in showrooms during the summer. MG will also launch a special model to celebrate the 85th anniversary of the brand at around the same time. The TF 85th Anniversary model will be available in three colours, and have bespoke graphics and alloy wheels. The interior will have 'Aubergine' leather trim and an upgraded stereo, along with monogrammed trim for the side sills and gearknob. There are also chassis tweaks, including upgraded suspension parts and a lower ride height. The 85th Anniversary model will cost 15,664. MG has also confirmed its participation in the Government's scrappage scheme, which will reduce the price of the TF 135 to just 11,511, and the 85th Anniversary model to 13,664.